Folding Shower Chair Folds quickly and easily for storage and travel. Provides comfort and support when bathing or showering. Contoured, durable plastic seat and backrest. Built-in holder for optional hand held shower, durable 1 anodized aluminum frame will not rust. Fixed height legs. Textured non-slip seat with drain holes. I live in an apartment and my tub is small . Will this chair fit in a small tub ? What is the leg width ? The leg width is 19.5 inches, according to the manufacturer. 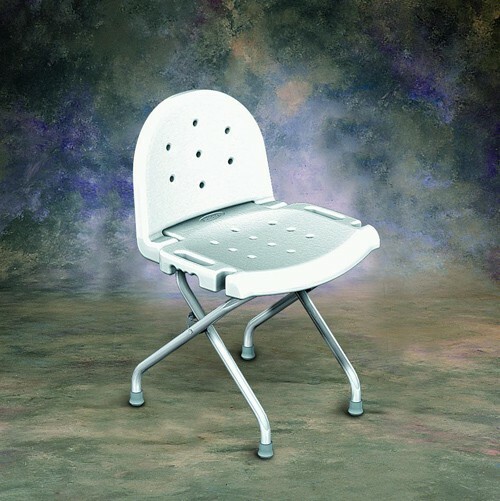 The shower chair is currently available only in white. Would like product specifications; e.g. Is seat height adjustable - No/Yes (range)? Weight capacity? Seat size WxD, fold-up footprint, weight of device, etc. Hello: We will answer your questions individually: 1. The seat is not height adjustable; 2. The chair holds up to 250 pounds; 3. Total dimensions: 17.5 inches (depth) x 19.5 inches (height); 4. This information is not available by the manufacturer; 5. Total weight: 8.5 pounds. Perfect size (open + folded) for my 2-ft by 4.5-ft step-in shower - but a bit tedious to open/fold. This is a good solution for my 90yo mom -- who lives with me and needs some shower assistance. I like that my shower size can also store the chair folded (so that it doesn't get in my way when I shower). Mom could never manage opening/folding or sitting/getting up on her own. Something to consider if buying for someone impaired to manage alone. Nice chair my wife likes it a lot .